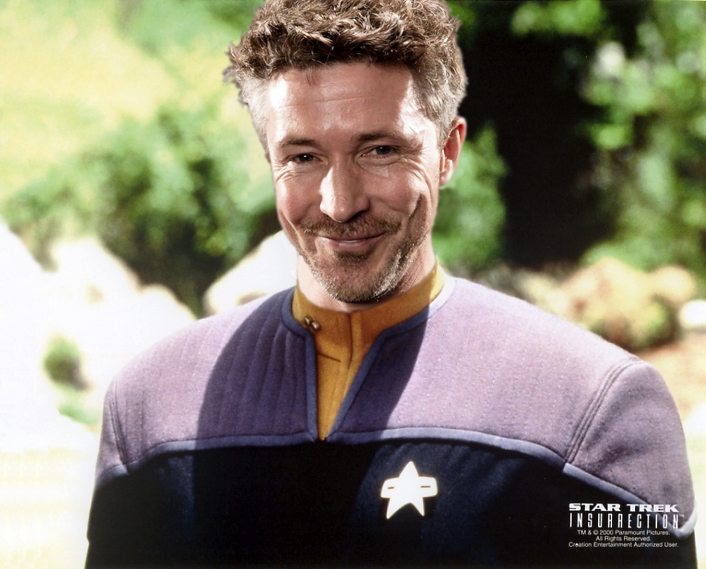 Physical Description McIntyre's physique picks him out as a cliche of Starfleet Security. Standing at over six feet he is physically imposing while his eyes belie a naivete which is heavily off set by the deep scar which runs down his right forearm and onto the side of his hand. Other Family Considered Lieutenant (JG) Olivier Thiffault (KIA) to be a brother after the younger Lieutenant came to his aid during a crisis. General Overview Psych evaluations have consistently placed an importance on McIntyre's predilection for humour (even in inopportune locations) as his most abiding personality trait. Different evaluators have suggested this both as a flaw and a strength but it is impossible to doubt that he has the best interests of his comrades at heart and will always consider the intricacies of an argument before offering an opinion. A strong will to succeed. A near sociopathic devotion to the completion of mission objectives. A dominant sense of humour and an ability to place comrades at ease. Ambitions While McIntyre does hope to progress up the chain of command, he is currently comfortable at the head of a thriving security department. The consumption and appreciation of alcohol. Family McIntyre has never had the misfortune to run across his absentee father and has been overheard in many watering holes across the galaxy claiming to have a special bottle of whisky he can't wait to smash around his face. As a result of a lack of contact with his father, McIntyre has always had a strong bond with his mother, Roisin McIntyre. Travelling around with her aboard various Starfleet vessels, the young Ciaran McIntyre developed a fascination with the security personnel whom his mother dealt with in her line of work (as a PTSD Counsellor). Relationships McIntyre's personality revolves around his defensive desire to be quick to a joke which often leaves him at a loss in the romantic department. His response to stressful situations, be they personal or professional is to talk too much and attempt to back away from the situation before it escalates. 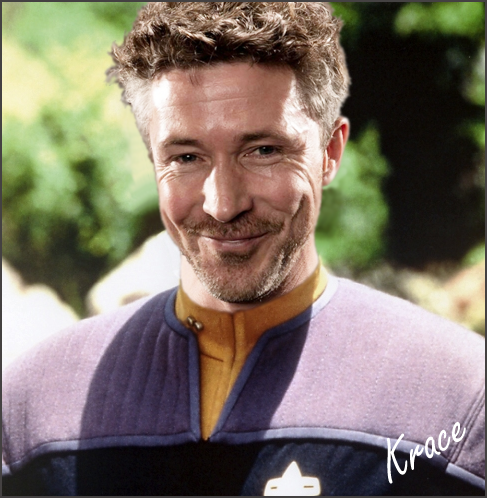 Friendships McIntyre makes as many friends as he alienates but he has remained firm friends with his "brother", Lieutenant (JG) Olivier Thiffault who once saved him from a particularly nasty incident with three Klingons and a splintered barrel of Blood Wine. Personal History Born aboard the USS Carthage in 2355 to a single parent, it had been assumed that Ciaran McIntyre would spend his early years rolling around Federation starships irritating maintenance workers. However, the child was quickly packed off to his Grandfather's smallholding on the Isle of Arran in Scotland (on Earth). For the first eight years of his life McIntyre was exposed to nothing but the heady aroma of fresh air and manure and attended a small school on the island which, at its busiest, had seven pupils. It was an idyllic life for a small boy and his Grandfather initiated him in the world of the hunt. For hours at a time the fledgling McIntyre would lie in wait, eyes straining down the scope of his elder's old hunting rifle waiting for the right moment to strike until BANG! the tin can crumpled and was sent spiraling to the ground. At the age of eight, McIntyre was torn from his haven on the small island and dispatched to live with his mother on Aratis Colony in Galactic South. Her work as a counsellor had taken her there to work with Starfleet veterans who lived in a permanent convalescence home. His childhood was as interrupted as it was enjoyable. McIntyre and his mother constantly moved from place to place, colony to colony, ship to ship and this left the young man with no real sense of identity. He clung to his Irish heritage (despite only his Grandmother, whom he never met, being Irish) and did his best to learn Gaelic during his time travelling. His progression was predictable when, at the age of 18, he applied for admission to Starfleet Academy and was accepted with the sponsorship and tutelage of his mother. Starfleet Academy From the moment he first arrived at the Marseilles Campus of Starfleet Academy, it was obvious to McIntyre that he was going to have a problem. No-one seemed interested in the freedom that being away from the authority figures in their lives gave them and being surrounded by conscientious and professional students was only ever going to go one of two ways for him. Surprisingly, the young man did not buck against the trends around him and managed to settle nicely into a study regimen that worked for him. He became part of a number of extra-curricular societies ranging from chess to a sport that he could never remember the full title of but that always left him with some kind of laceration. It soon became obvious that his calling was in the tactical field and at the behest of his tutors, he moved into a specialised course which removed many of the more general elements of the curriculum and allowed him to focus on military history and dimensional tactics. He graduated from Starfleet Academy with distinction in 2377. Early Career A scholarship at the Nelson Military Institute followed in which McIntyre was allowed free reign to theorise on the creation of new tactics for ship-to-ship combat. His time at the Institute was mostly spent locked in a room surrounded by PADDs and, while it served him well in his future career, is not a time that he remembers with any fondness. His potential as a tactical officer was initially realised by Lieutenant Stanley who was the Chief Strategic Operations Officer aboard the USS Buchanan. He insisted on the appointment of the young Ensign as a tactical officer and set about moulding him in his own image. Unfortunately for Lieutenant Stanley, McIntyre didn't take too kindly to being moulded in anyone's image and the Lieutenant quickly realised that he had bitten off more than he could chew with the fast-talking, fast-thinking graduate. The position of Chief Strategic Operations Officer became open elsewhere and the Lieutenant was packed off to the Northern Rim and the Ensign was allowed to continue his work under a different officer. The ensign was reprimanded after he wandered away from a maintenance group assigned to a Klingon outpost and was beaten to a pulp by a group of Klingon smugglers and their pet Ta'arg. It was only through the intervention of then-Ensign Remy Thiffault, who communicated the Ensign's plight to the Klingons in their own language that he was saved. Later Postings McIntyre is unlike many Starfleet officers in that he managed to maintain the same ship during many subsequent tours of duty. While many are forced to move on to different ships and areas of the fleet, McIntyre was able to forge a career on the USS Buchanan, eventually rising to the position of Chief Tactical & Security Officer and becoming a trusted confidant of Captain Tyrrel. However, time doesn't hold on forever and after twelve years aboard the outdated Excelsior class vessel, it was decided that she was to be scrapped. McIntyre and his crewmates held on with bated breath to see if they would be given one Starfleet's greatest honours- a wholesale transfer to a new vessel but the order never came and one-by-one, the crew were reassigned to different vessels operating in different parts of the galaxy. USS Endeavour After a short secondment to the Starfleet Academy adjunct on Starbase 332 working as a tactical systems instructor with 'Gold' Squad, McIntyre was eventually reassigned to the Sovereign Class USS Endeavour under the command of Captain Benjamin Byrne. His time aboard came to an abrupt end when, on his first mission as part of the crew, the Endeavour was destroyed after an altercation with an unidentified vessel. 2378 - 2389: Assigned aboard USS Buchanan, Excelsior Class. 2390: Present: Assigned aboard USS Endeavour, Sovereign Class. 2390: Taken off active duty for psych evaluation. 2390: Reassigned aboard USS Highlander, Intrepid Class.